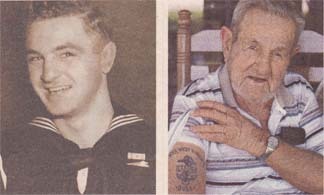 Henry Newton Keith is a Pearl Harbor Survivor from the USS West Virginia. He joined the crew of USS West Virginia in August 1940. In 1940 and 1941 he was the heavyweight champion of the Pacific Fleet. On December 6, 1941, Hank had spent the evening on shore enjoying Honolulu's fine nightlife. As part of the crew in the "radio shack" he was painfully aware that his wake-up call was 6am. Wanting to enjoy a few more hours of sleep, he decided to "drop anchor" under an ammunition hoist on the opposite side of the ship-far away from where he and his radio brethren normally slept. It was a decision that may have saved his life. Hours after the attack, Hank learned that his two best friends and bunkmates had been killed in a torpedo blast. He said a blast from the USS Arizona was so powerful that it blew his undershirt off his body like a skin off an onion. Seven days after the attack Hank volunteered for duty aboard the USS Lexington. He joined Torpedo Squadron 2 and served as a rear gunner on torpedo planes. During the battle of the Coral Sea, Hank's plane was the last torpedo bomber to safely land on the USS Lexington. With seven other sailors, Hank manned machine guns on the port side of the smoke stack. When a bomb hit, the other seven were killed and Hank had taken shrapnel to the knee. He abandoned ship and was rescued. His injury left him with limited shore duty until he left the navy on November 8, 1944. After the navy, he delivered mail for several years and ran a charter fishing boat for 35 years.